Fleeing from the Daleks, the Doctor and his companions find themselves being chased through time and space. I liked this episode and then I was deeply annoyed by this episode. The initial premise of this serial was interesting; Daleks chasing the Doctor throughout time and space. Yet, the serial only goes about fifty percent in the effort/presentation. Some of The Chase scenes involved historical scenes that could have been edited and pushed for four parts instead of the longer six parts. The pacing is off and I felt bored at some times which should have been the opposite effect. The best part about the historical Chase bits was the Peter Purves scenes in New York. It was quirky enough that the sequence could be as long as it was. I thought the opening sequence with the Time-Space Visualizer was very interesting because it reminded me of the Guardian of Forever in the original Star Trek series episode The City on the Edge of Forever. A quick Wikipedia search led me to discover that this particular Star Trek episode premiered in 1967, two years after this episode of Doctor Who aired. I can’t help but assume that writer of that Star Trek episode, Harlan Ellison, might have been a Doctor Who fan or was aware of the program. The first part of the serial should have been the benchmark that the rest of the installments should have achieved. There is a great suspense to the first episode with the companions being separated from each other and the TARDIS. The first time that Barbara and the Doctor sees the Dalek emerging from the sand is chilling. It serves as a reminder that these creatures are horrifying and worthy of being one of the Doctor’s greatest enemies. One of the problems that I have with this serial was that there are many “convenient” moments within the episodes that explain how the Doctor is being followed or how he escapes. While it’s fun to see these technical aspects of how the TARDIS operates, I can’t help but be annoyed. This feeling comes up again with the double Doctor plot. While the clone robot Doctor plot was fun to watch the manner in which it was presented was a little laughable. The voiceover from the fake Doctor was not lip synced very well and the fake Doctor was far too skinny to be an exact replica of Hartnell. I can’t help but wonder why they didn’t just use Hartnell for those scenes. The final battle scene with the Daleks and the Mechonoids was a great ending. I feel that the beginning episode and the last episode were the strongest parts of the serial. The installments in the middle should have been edited to fit within these exciting episodes. DVD Note: I usually don’t comment on the special features of the DVDs but the third disc of this DVD set has this great documentary about Daleks. “Daleks Beyond the Screen” Highly recommend. The cowboy character at the Empire State Building was played by Peter Purves, who would later play Steven Taylor, the new companion introduced in the last part of this serial. This is the second time that Ian has destroyed one of Barbara’s cardigans, having destroyed one to use as guide through the Space Museum. I found the book to be a little bit more fun in terms of back-story than the serial. In terms of storytelling, the serial is better but not by much. In terms of the back-story, this almost felt like an encyclopedia for all things early Who. Okay, maybe not that extensive but I found myself writing down little things that I found interesting if I were ever to create such encyclopedia. When the Daleks discuss their greatest enemy, there is mention of how the Doctor has changed his appearance many times over the years. While this adventure was set in the First Doctor’s adventures, I can’t help but wonder where the Daleks were in their timeline in relation to the Doctor’s timeline. The book mentions that is almost 750 years old but had yet not reached his first regeneration. Vicki mentions that in her timeline on Earth there had been work towards inventing a machine that would allow historians and scientists to tap into the Time Vortex to witness and record events of history. It should be noted that Vicki stems from the 25th Century. I couldn’t help but think of Captain Jack Harkness and the Time Agency of the 51st Century. It’s interesting to note the evolution of the understanding of time and how it affects science work throughout Earth’s history. As the humans were just beginning to understand the Time Vortex in the 25th Century, how long did it take before the Time Agency of the 51st Century to be a full functional time travel entity? Often times the Doctor displays a great deal of arrogance that jeopardizes his companions. While this a past issue with the Doctor, and will be for the future incarnations as well, it’s distressingly annoying to read. I do realize that this is more of a youthful issue with this incarnation but it makes the Doctor seem entirely too careless when his companions’ lives as well as his own are on the line. This is made even more apparent when Vicki is left behind at the The House of Frankenstein, forced to fend for herself, and to sneak onto the Dalek vessel in order to regroup with her fellow travelers. 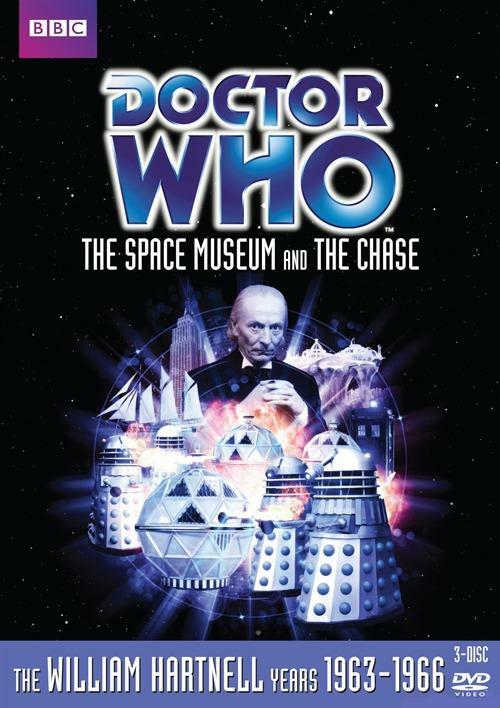 The book explores a lot about the technology of the TARDIS and the Dalek ship, particularly with one scene in which Vicki is trying to make contact with the TARDIS using radio transmissions. The Daleks also create a replicate Doctor. Since I have only begun in my Doctor Who viewing adventures, I can’t help but wonder if this is attempted by the Daleks later in their encounters or is this a one-off attempt? Steven discusses a great expansion period that Earth experiences in the future but were distracted by the Draconian conflict and then the Third Dalek War. In terms of the character development, I think the serial presentation is the better of the two in that showing the emotions the Doctor tries to hide when Ian and Barbara leave is more impactful than how the adaptation presents the scene. The book adaptation left me feeling that it was a mundane exit as opposed to the serial in which I found myself crying and hugging my couch pillows. I do appreciate how much sass Ian has when he talks to the Doctor. The Doctor is never has forthright as he should be with information and can be condescending when he explains things to his human companions. Ian retaliates with sarcasm and wit which irritates the Doctor is the most amusing fashion.